Why brides are warming to a winter wedding. The days are getting shorter and the nights are getting chilly. What better time to hold a wedding, than in winter. After all, ‘Winter White’ is fast becoming the new ‘Black’ in the wedding scene. It seems that more and more couples are choosing the cooler time of the year to exchange their vows. 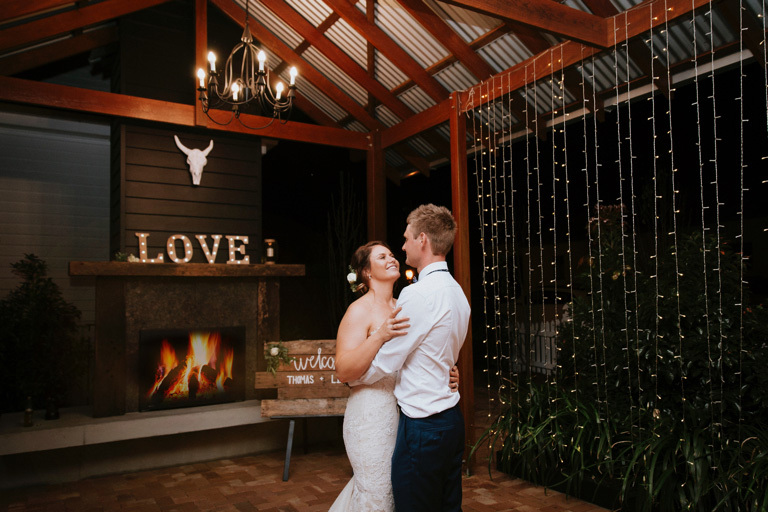 What all started with cute, country venues holding ‘Christmas in July’ has now become a great reason to ‘Celebrate a wedding in July’. Couples love the cosiness, the fireplaces and the hearty, warming food. It gets darker early, so the magical fairy lights that come on much earlier can make the evening even more magical. It’s when all the magnificent, fragrant flowers come into season. So, your guests will know that you’re about to make an entrance with a blast of beautifully pungent winter blooms. And better still, your bouquet will certainly not wilt like it does in those warmer months. It’s the season for beautiful long-sleeved dresses, great-grandmother’s faux fur shawl or that velvet wrap you’ve always cherished. What about beautiful ‘bridal boots’? Remember that your bridal makeup will not melt and your hair won’t droop and stick to your neck! Winter weather is much more comfortable for the men wearing suits, whether it be the groom, groomsmen, or your guests. For grooms and groomsmen what about a velvet blazer? A nice thick fabric which will keep the guys warm, plus it’s perfectly on-trend. Winter weddings give you an even better excuse to give your husband-to-be something brilliant like a pair of woolly socks (so he doesn’t get cold feet). 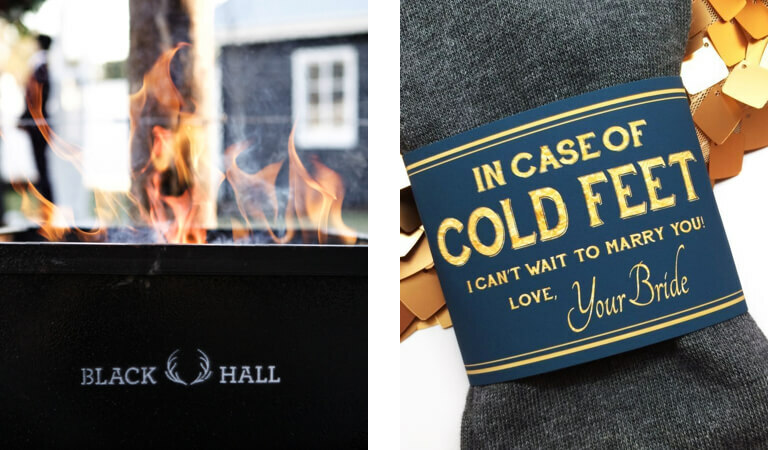 You could make them super memorable by getting them embroidered with a special love message and wedding date — so you both have a hidden secret between you on the day? Crisp nights mean open fires and fireplaces. Be sure to find a venue with the perfect winter ambience, as well as the ability to keep you and your guests toasty warm. Add Romance with candles and fairy lights. It will be dark quite early, so embrace it with lots of romantic moody lighting in both your ceremony and reception space. 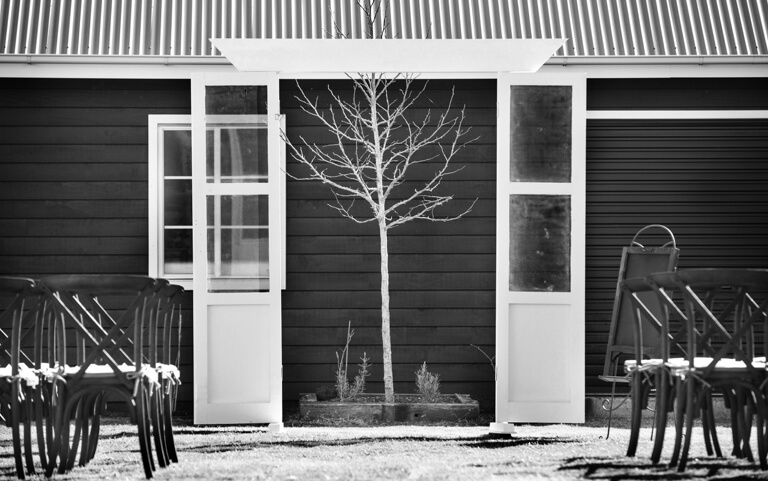 Your wedding photos will be enhanced by the wintery surrounds largely thanks to the dramatic, bare trees that contrast with the sky. And whether the sky is overcast or blue on the day, you can be sure that winter means amazing photos. Winter is usually a drier time of the year (so not as many rainy days to spoil your photos) and the nights are usually crisp and clear. If you’re out in the country, it’s guaranteed the skies will be filled with stars. So, before you flick to the wedding calendar for that special Spring date, and before your chosen wedding venue says that ‘they’re booked out for that time of the year for the next 2 years’, remember to ask about the ‘coolest time’ to hold a wedding — in Winter.